Once the preserve of Fishermen, Train spotters, ya Gran and Father Christmas; Crochet Couture (or Knitwear) is fast becoming a staple for celebrity wardrobes and style icons the world over. And as I was about to discover, the genre defining design trio known as Sibling have certainly played a part in the revolution. Sibling, along with their womenswear equivalent - Sister by Sibling - are renowned for a playful sensibility, with a focus on an alternative, and often outlandish, use of knitwear. I met with 2 of the 3 strong design team Sid Bryan and Cozette McCreery last week at a meet and greet event hosted by Hervia Bazaar on Spring Gardens, Manchester. Over the years, Hervia have brought notorious designer collections to Manchester from the likes of Rick Owens and Alexander McQueen, as well as Comme des Garcons Play and Carven alongside today's special guests. I’ve been knitting for years and working as a knitwear specialist for years before but all three of us are obsessive about knitwear and knitted products. Explained Sid. There’s been a real trend over the last decade where knit wear has become much more interesting, exciting and commercial. And I believe we are part of that revolution. I’m not sure about Manchester but in London you can’t walk around the corner without seeing a sign for a knitting group, grans and kids getting together to create, you know 20 something’s getting into the craft. Hervia and the team have been great supporters of Sibling since we started 8 years ago, and visits like this help people to understand what the brand is about and gives consumers the opportunity to meet the designers behind the brand and the pieces. Cozette declares. It seems Hervia aren’t the only great supporters of the UK brand, ‘Happy’ singer Pharrell Williams wears Sibling, Mariah Carey's a fan and Beyoncé’s wearing Sibling in her new book. UK style warrior Noel Fielding is also partial to a bit of Sibling. A-listers aside, I think of wool as more of a Winter fabric, born on the coast in chilly Cumbria I associate the fabric with being great at keeping your head warm at the cost of a sweaty brow, a fair trade when you live up North, but it seems we’re not talking about plain o’ run of the mill wool here, Sibling take a more scientific approach to yarn and fabric creation, Sid explains. For us it’s all about working with combinations of fibres to see what we can make those blends do to make them most interesting. It’s about the aesthetic and to a certain extent the wear ability. We aim to create desire. Alchemy V’s Engineering or simply Rows and Stitches? Certainly it is mathematics and engineering but really it’s about rows and stitches when you bring it down to its very basics roots. From 1 thread we create fabric. We work with all kinds of fabric & materials, particularly when we create our shows. Last year for the women’s collection we made an elastic band dress from 1,000’s of small bands knitted together and integrated into the fabric. We love to break with tradition. Says Cozette rebelliously. Everything we do is deep rooted in tradition and our craft is needles - we want to take that and see how we can make it modern. We add a Sibling twist to everything we create. No Stranger to collaboration - Sibling worked with Pudsey for Children In Need 2012 and designed and produced an outfit for Disneyland Paris’ Extended 20th Anniversary celebrations. Their Knitted Skull and matching Skeleton leggings from Collection 2 are part of the permanent collection at the Metropolitan Museum of Art, New York. 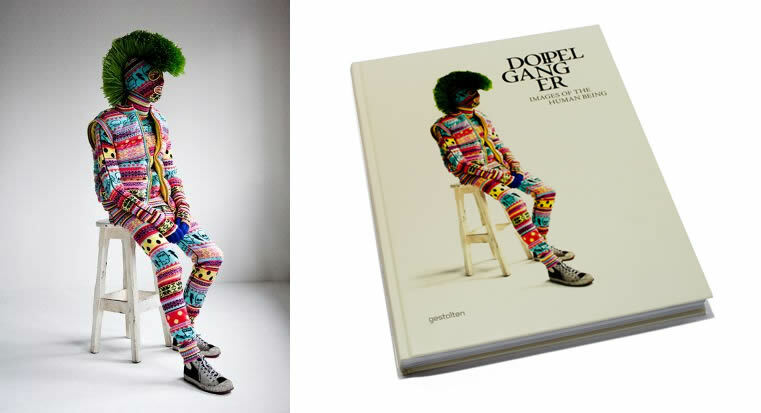 Their famous Knit Monster (pictured left) takes the cover of the book Doppelganger published by Gestalen and is traveling as part of the Global Wool Modern exhibition. We just finished working on an art project with Studio Voltaire, For twenty years, they have been supporting artists with their renowned programme of exhibitions, performances, events and education projects. The project included a pop up shop in Mayfair called House of Voltaire. We’ve also been working with a Turner prize nominee called Jim Lambie, that project has been realised just this week which is very exciting. 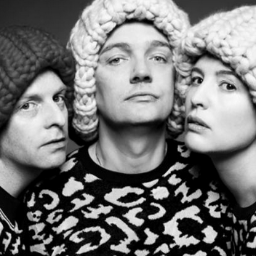 We’ve taken some of his art work and translated them into knitwear. Next week’s V&A show is a great honour, we will select special pieces going back to the very beginning of our men’s wear designs. Are collaborations a profitable consideration or mostly for marketing and extending your reach? Well that depends on who it is and at what level they are. We will work with anyone who we feel is like us and their aesthetic demands meet with ours. After that it’s down to the relationship and whether it excites us, if it does then the project could happen. Our aesthetic is all about an optimistic, youthful, energetic and powerful vision. That sums up our attitude and mentality towards it and it is business first and foremost but if a museum in Spain wants to display a red pom-pom and call it Art – that’s fine by us. We don’t set out to make things to go in museums, we make things to put on people’s backs. That is where the joy lies for me. Knitwear is easy, you just stick it on and you’re dressed. It’s not quite 1 size fits all but it’s getting there. How important is the fit? And are Sibling clothes easy to wear? Well that’s another great thing about wool, exudes Cozette. We work with a lot of model agencies and they are always keen to have a fitting, with wool and knit wear there’s no need to allocate time on the fitting. Maybe the catwalk highlight pieces aren’t so easy to wear but we wouldn’t expect those pieces to make it into commercial collections. Sid tells me that elements from the catwalk will make into the collection and whilst we're not likely to see anyone sauntering down Market Street in crochet shorts anytime soon, they’re great for adding a little theatre on the catwalk. And it is great for press, If Sibling can provoke someone like Jeremy Clarkson to slag them off in the Times or Jonathan Ross to make a joke of them on his show, whilst It might provide a comedy element for them - most important for my new wool warrior friends their creation and has become legitimately news worthy. So far, Sibling mission accomplished.